While the card and stack method of multitasking in webOS will allow you to see many of your open applications at once, you are only able to get a small glimpse of what is on the screen for any app beside the top one. While this made sense for phones that have limited screen real estate, the TouchPad offers a much larger area for you to work with so it would be great if you could see more of the open apps in a stack. Unfortunately, you have no say in how much each app overlaps each other. 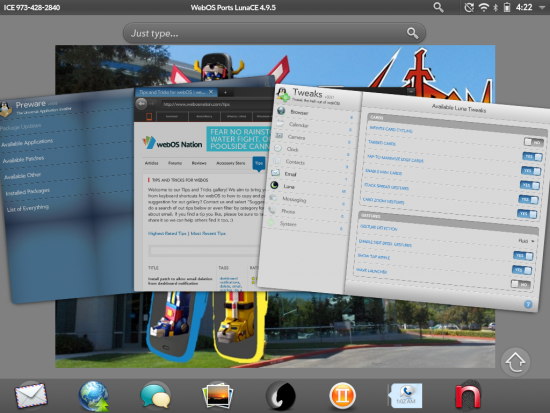 However, once HP released their Open Source "webOS Community Edition" for the HP TouchPad (not to be confused with Open webOS), the group at WebOS Ports was able to give you the ability to adjust the overlap settings with a simple gesture as part of LunaCE (pronounced "lunacy"), available in Preware. Note that LunaCE is currently in beta so you will need to go through the process to set-up the beta feeds in Preware, which can be found at testing.preware.org. In addition, you will need to have Tweaks installed on your TouchPad to toggle this new feature. Once you go into the "Luna" section of Tweaks and toggle "Stack Spread Gestures" to YES in the "GESTURES" section, you can then perform a two-fingered zoom-in or -out gesture when in Card View and you have a stack with more than one app. For stacks with only two cards, you spread the cards enough to be able to see almost 75% of the app in the back. As you can see in the screenshot, for 3-card stacks, you can spread the stack where you can still see more than half of each app. Of course, as you add more apps to a stack, the visible area of each app will go down as well. And If you want to go back to only seeing a sliver of each app, just pinch your fingers together and they will collapse back together.